Film laboratories offer a wide range of services in a competitive market. Although labs will mainly work with feature film productions they understand that short films and artists' projects constitute a valuable part of the usage of film (from Super 8, 16mm and even 35mm) and may feel that it is in their interest to invest in these productions. It is important to contact a few labs (not all labs process every film gauge or stock) and see which will give you the best offer and service for your project. Be sure to outline the entire processing procedure (from printing low-quality rushes, telecine if required, negative cutting, grading/timing, sound processing, optical effects, and the production of the final screening print) and ensure that you cover all the stages in your budget. Try and get a contact at the lab who will look after your project and with whom you can discuss any mistakes or errors made in printing if need be. Most labs offer a variety of services in addition to processing. The most common secondary service they will provide is Telecine. The word derives from 'television cinematography' and refers to the machine that converts the images on film into a signal that can be stored on videotape. A telecine machine is used to process anything shot on film to a video or digital format (for offline/online editing or broadcast). There are a variety of machines and processes used. 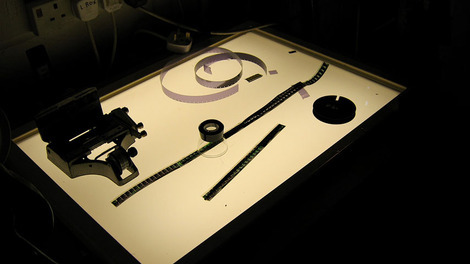 If you are going to do an offline edit of your film that will then be passed onto a negative cutter to make a film print, you will not need a high-quality telecine (as its just for reference). But if you intend to show your work from a digital format then you would require a high quality telecine. To make a screening print you will have to go through the two following stages.Grading or Timing- the process of adjusting the density and colour values for each shot in a film in order to achieve consistency and balance throughout the final print. And Negative Cutting - this is the cutting of the negative so that it exactly matches the work print (or offline edit) of your film, most labs offer an in-house negative cutter or can recommend people to carry this out. Then the process is completed with the production of a final positive print from the cut negative. It is also possible to hand process film yourself. No.w.here Lab run training courses and have equipment to help you develop your own film. For more information on hand processing we recommend you read Luxonline's excellent guide DIY Dev and Print. Cinelab London are the UK’s only full service film laboratory, offering a range of services for 35mm feature film, front end negative processing, HD rushes deliverables, laser film recording, Film distribution printing, film restoration, and cleaning, as well as digital archive and digital cinema mastering and distribution. Deluxe are a large post-production facility offering 35mm positive and negative developing as well as 35mm film print duplication and grading services including colour timing. The KODAK Film Lab London offers comprehensive colour negative processing services for motion picture films. Our lab houses two Photomec Silver Sprinter processing machines that can handle over 90,000 feet every 10 hours. Using Kodak’s pre-mixed chemistry, we run day and night baths Monday through Friday and on weekends by arrangement. Our dedicated team of highly skilled film technicians have extensive experience working on major feature films, commercials, promos and archive projects so you can be assured of the very best service and support for your project.